Self-evident screens, simple and quick invoice creation. 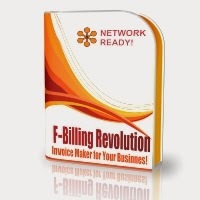 Unlimited invoices, orders, payments, customers and products. Network ready, supports multiple users at the same time over your LAN network. Supports stock control. Unicode/UTF8 character sets. Editable customers database, products & services database. Print or email professional invoices with Your company's logo. Partial searches on customers, products, invoices, etc. Supports use of a different Currency Symbol in different companies. Manage your invoices and reports. Print sales messages or comments on all invoices. Append new products and customers "on the fly" from within a new invoice, in seconds. Pop-up your product list from within the invoice, then click on a product to automatically add it to your invoice. Insert line items on invoices, use the description field to extend your product descriptions for each line-item. Built-in software updater, & built-in automatic database backup. PDF support, email your invoices or reports in PDF format. Extensive software settings, simple to set-up, learn and use. Year 2000 compliant, includes date-selection calendar or you can type in the date. Send e-mails to multiple e-mail addresses by separating the e-mail addresses with a comma. Password protection. Ideal for small and medium business.